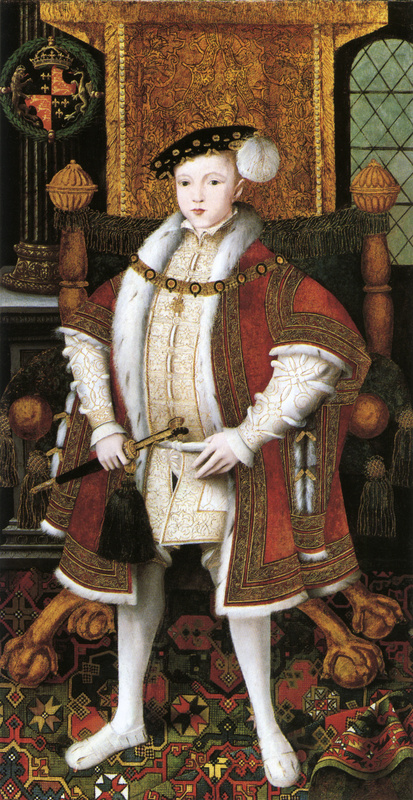 20th century historians have not always been kind to Edward VI, the nine-year-old boy who followed his oversized father, Henry VIII, on the throne in 1547. The famous G. R. Elton, in his best-selling England under the Tudors, was positively abusive on the hapless teenager: ‟Edward played no part in his reign; … his character and views … were neither attractive nor promising. Edward was naturally haughty and arrogant, like all Tudors; also like his family, he had a marked intellectual ability which an appalling schooling had turned into a precocious passion for protestant theology. The king was a cold-hearted prig, a fact which even the pathos of his miserable death cannot make forget. Self-righteous, inclined to cruelty and … easily swayed by cunning men, he exercised such little influence as he possessed in favour of disastrous policies and disastrous politicians.“1 Against such fulmination, to be an ‟articulate puppet“2 is a friendly description – but is it a fair one? The same 20th century also saw the King on the ‟threshold of power“ well before his death three months short of his 16th birthday;3 indeed by the standards of the time, at 15 he was old enough to be expected to assume full responsibility: Henry VI of England, Charles V, Charles’ father Philip the Fair and son Philip II, to name but a few, all achieved their majority aged between 14 and 16. In view of the fact that countless adult monarchs left day-to-day business and even pivotal decisions to their more or less gifted ministers, the question how much influence Edward really had is almost an academic one. One important – and often overlooked – aspect to understand is that he grew gradually into his office of king,4 and in contrast to some decades ago, today no serious historian would claim that ‟Edward played no part in his reign“. During the royal minority the monarchical state did not cease to exist; according to Henry’s will a council of the late king’s executors was to rule in Edward’s name until his 18th birthday. Within days of Henry’s death, though, this provision was changed so that Edward’s maternal uncle, Edward Seymour Duke of Somerset, should rule as Lord Protector of the Realm and Governor of the King’s Person (the latter function being performed in practice by Somerset’s brother-in-law, Sir Michael Stanhope, and by his wife’s stepfather, Sir Richard Page5). This hitherto unprecedented concentration of offices in one man was immediately opposed by the Protector’s younger brother, Thomas Seymour, and in early 1549 he tried to obtain the King’s help (and signatures) in a wild scheme to gain more power, an adventure which led to his execution. Already in the autumn of 1547 the letters patent which had established Somerset’s protectorate had been reissued with the clause that his authority would no longer cease on Edward’s 18th birthday, but at any point at the King’s pleasure. Also repealed was a 1536 statute that had allowed kings to ‟suppress by letters patent any statutes passed before they reached the age of twenty-four.“6 Obviously, this measure was intended to protect any reforms – for example of religion – passed during the minority years. Original Letters Relative to the English Reformation. (ed. Hastings Robinson, 1847). Cambridge Universtiy Press. Elton, G. R. (1991): England under the Tudors. Routledge. Hoak, Dale (1976): The King’s Council in the Reign of Edward VI. Cambridge University Press. Schulin, Ernst (1999): Kaiser Karl V.: Geschichte eines übergroßen Wirkungsbereiches. Kohlhammer. Tytler, P. F. (1839): England under the Reigns of Edward VI. and Mary. Volume I. Richard Bentley. Wolffe, Bertram (2001): Henry VI. Yale University Press. This entry was posted in Andrew Dudley, Edward VI, John Dudley and tagged Duke of Somerset, Henry Sidney, John Gates, minority, Thomas Darcy, Thomas Seymour. Bookmark the permalink.